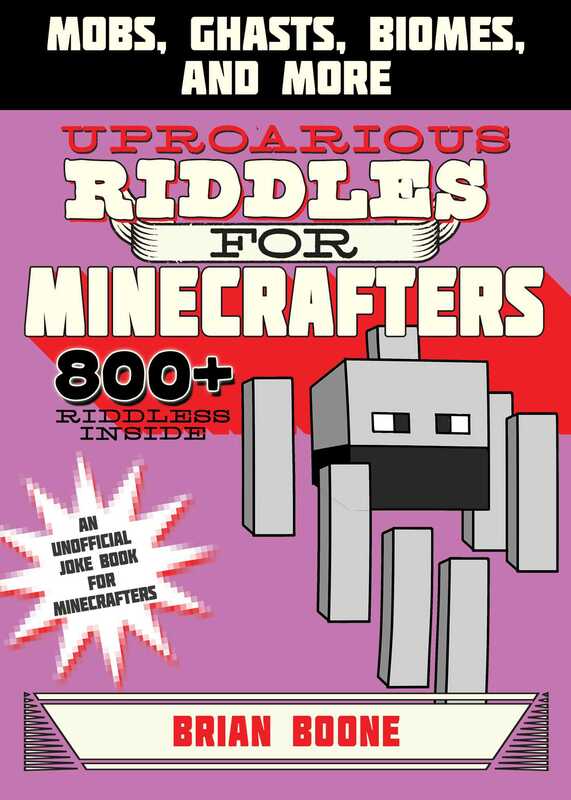 Uproarious Riddles for Minecrafters is the fifth book in the Jokes for Minecrafters series, which is complete with more than eight hundred riddles! "Dig in" to these funny brainteasers about Minecraft mobs, tools, and biomes that will really make you think! You'll have such a BLAST reading all of these crafty riddles and jokes. All of your favorite parts of the Minecraft game are included in the book, and the riddles will have you continuing the Minecraft fun! Inside you will find funny riddles such as: Q: I am very hard to find, and if a friend has me you’ll be green with envy—but not as green as me. What am I? A: An Emerald Block. Q: We're very good at spelling, but you won't find us in any school or spelling bee. What are we? A: Witches. For kids ages five and up, this is the perfect book for at home, at school, or really anywhere! You’ll enjoy telling these silly jokes to your friends and family. As a bonus there are silly illustrations throughout for extra laughs!